Following on from it’s regional award in May, 20 Eastbourne Terrace is now the National Winner for Refurbished/Recycled Workplace at the 2017 BCO Awards. 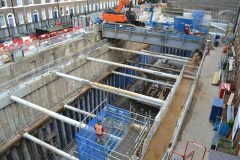 The excavation of the new 18m deep 3 storey basement for the new £50m hospital building for UCLH is now complete. 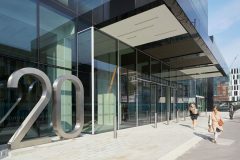 The new facility located on Huntley Street in central London will, once complete in 2019, house a new state-of-the-art centre for ear, nose, throat and dental services. 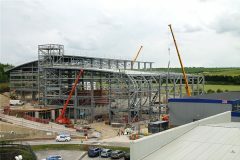 Work on site for the new Facilities Support Building at the Rutherford Appleton Laboratory at Harwell in Oxfordshire continues at pace. Contractor Wilmott Dixon and specialist steelwork fabricator/contractor Hambletons are nearing completion of the primary steel structure to CNM’s design. The refurbishment of No. 20 Eastbourne Terrace for Land Securities won the ‘Best London Refurbished/Recycled Workplace award’ at the BCO (British Council of Offices) awards for 2017. CNM’s latest project for repeat client Taylor Wimpey East London was granted planning consent by the London Legacy Development Corporation Planning Committee on 25 April 2017. 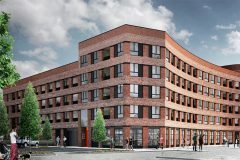 Wick Lane is a 18,329m2 residential-led mixed use development in Bow. Six unique buildings with their own character will provide 176 high quality residential units. External residential courtyard amenity spaces are provided on first floor level podium levels. One and two storey commercial units and a designated general industrial unit will provide employment space for existing and new local businesses. A retail unit is also provided at ground floor. A new pedestrian connection will be provided via stairs and ramps to the Greenway, linking the site to the London Stadium and Stratford. Image courtesy of dRMM architects. Visualisation by Cityscape. A big thank you to CNM structural engineer Rachael Humphreys for organising this year’s corporate fundraising activities. 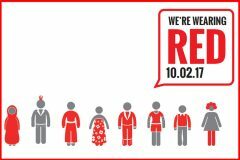 Wear Red is the global day of fundraising in aid of disaster relief charity RedR. Please click here form more information on RedR. 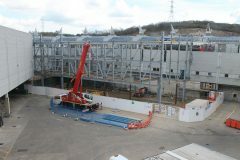 Work is well underway on site for the new Facilities Support Building at the Rutherford Appleton Laboratory at Harwell in Oxfordshire. 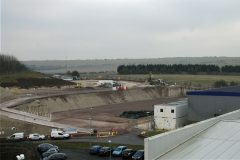 Contractor Wilmott Dixon has completed the bulk earthworks and other enabling works in advance of the construction of the new CNM designed building. CNM’s latest project for repeat client Peabody was unanimously granted planning consent by Greenwich Planning Committee on 1 November 2016. 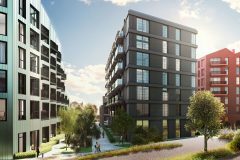 The Reach is a 5,522m2 residential-led mixed use development in Plumstead, which will provide 66 high quality homes arranged around a new communal garden and includes flexible community and commercial space at ground floor. Enabling services diversion and foundation piling works are now complete on the H&M Extension at Bluewater and erection of the structural steel frame for the new-build service yard extension is progressing well. The shell and core works are on programme for completion for August 2016 and will result in H&M upsizing their current 25,000ft2 outlet to create a new 40,000ft2 statement store. Internationally renowned lingerie brand, Victoria’s Secret has now opened at the Oracle in Reading. The 9,000ft2 unit is Victoria’s Secret ninth UK store and is located on the Upper Mall next to Apple and Debenhams. CNM provided full structural engineering and retail delivery compliance monitoring services and the works involved the amalgamation and major reconfiguration of existing units including the construction of a new mezzanine floor. 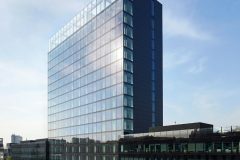 This is CNM’s first completed project at the Oracle for the Client and Landlord, Hammerson and we are currently involved on several other asset enhancement projects there.